While reading Saint Teresa of Avila’s autobiography I found her humility incredibly striking. Here is a piece of her advice to any person wishing to grow closer to Our Lord: “Let us endeavor always to look at the virtues and good qualities that we find in others, and to keep our own great sins before our eyes, so that we may see none of their failings” (92). Particularly in this time of quick judgments of others, each of us desperately need to take St. Teresa’s advice here. In this modern world where people constantly need affirmation, what we really need is humility and forgiveness. If pride is the root of sin, we must never stop seeking humility and ask God to grant us this gift. When evils assail us, we must approach everything with a humble heart, or we will quickly become what we hate. From a favorite collection of poems of mine, The Four Quartets, T. S. Eliot writes, “The only wisdom we can hope to acquire is the wisdom of humility: humility is endless.” Humility is the antidote to our times, and every era in history. Our understanding of sin cannot remain abstract. Many Christians are quick to call themselves sinners, but too often it becomes an abstract knowledge. In our heads, we know we sin often, but if we are honest with ourselves, sometimes we do not know it in our hearts or we do not know from where it comes. It is easy to miss the failings, the big and especially the small, if one does not honestly examine oneself often. One very clear way to do this is to examine one’s conscience and go to confession often. Driven by love of God and desire for reconciliation with our Father, one can offer an honest confession, bringing one’s sins out of the dark where the devil shames and deceives, and into the light of truth before God to be forgiven. This is one way our Father brings a person close to Himself and under His care, not shaming her, but forgiving her and offering grace and encouragement to fight the good fight against sin, death, and the devil. The problem is we are scared to look our sins in the face to see them for what they are—offenses against God, wounding our relationship with Him and our neighbors, and wounding our own souls. But if we do not see our great sins, how can we love God as we ought? Jesus says to the woman, a sinner, who anoints his feet with expensive perfume and washes his feet with her tears and hair, “Therefore, I tell you, her sins, which are many, are forgiven, for she loved much; but he who is forgiven little, loves little” (Lk. 7:47). We want to identify with the woman in the story who loves much; however, without understanding the magnitude of the sins for which we are forgiven, we cannot approach God with true contrition. More often than not, I think many of us welcome Jesus into our homes, forgetting who He is and who we are before Him. We want Him to be with us, but without ourselves being seen as fools in need of great mercy. We fool ourselves into thinking we are actually good enough to have Jesus by our side, and all this because we fail to see the sins lurking our lives. We let the fear of seeing them keep us in a lukewarm faith. In reality, our sin ought to be enough to bring us to our knees before Jesus, offering Him all we have, kissing His feet and asking for mercy. If we do not see our great sin, how can we offer him great love? The great thing about confession is we do not only confess our sins, but we are forgiven them. The Pharisees recognize this is no small thing. No one has the authority to forgive sins. Only God can do that. And Jesus, who is God, does do that when the woman comes to Him with a repentant heart. He tells her the truth and what she longs to hear: “Your sins are forgiven… Your faith has saved you; go in peace” (Lk. 7:50). Not only does she come to him in repentance, but she goes to Jesus knowing He can forgive Her sins. He does just that, and tells her to go in peace. In forgiveness, God offers us peace. It does us no good to despair over our sin, and we are deceived if we think dwelling obsessively over our sin makes us pious. God calls us out of our sin and offers us the grace to overcome it. One gift He, in His mercy and love, has offered us to aid in our fight against sin is confession. And when we mess up, we know His love is always waiting, beckoning us to receive His love and forgiveness again and again. 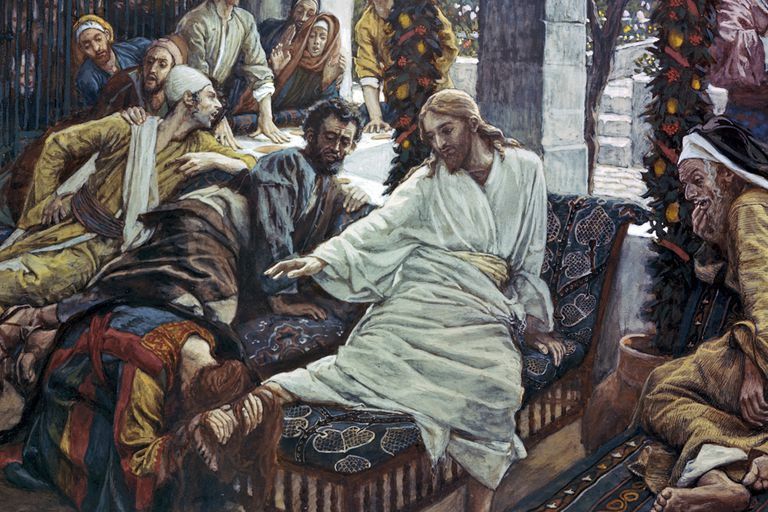 After Jesus’ resurrection from the dead, He comes to the disciples and reveals Himself to them. In the Gospel of John, it is written, “Jesus said to them again, ‘Peace be with you. As the Father has sent me, even so I send you.’ And when he had said this, he breathed on them, and said to them, ‘Receive the Holy Spirit. If you forgive the sins of any, they are forgiven; if you retain the sins of any, they are retained.’” (Jn. 20:21-23). When Jesus breathes on the Apostles, He ordains them to the priesthood, marking them with the gift of the Holy Spirit, giving them the special gift to forgive sins. As the apostolic mission of the Church continues, she ordains men to the priesthood, always passing on the gift of the mystery of the priesthood from bishop to new bishop, who consequently appoints new priests. The line of bishops goes all the way back to the Apostles themselves, and thus, to Christ Himself. As He wills it, He breathes on men and brings them into the priesthood, giving to them the gift of the forgiveness of sins in His stead. Souls are still healed in the very same way they were 2000 years ago. We can have confidence that God is doing His great work of healing in us that He began with His own Son. He offers us His very presence today, in the present. We get to go to a priest and ask for forgiveness as we would go to Jesus Himself. This is not abstract; this is not only in our heart, but this is real, as though we were literally talking to Him ourselves, and hearing Him speak forgiveness over our lives. What a beautiful, beautiful gift. Fr. Mike Schmitz – Why Confess My Sins to a Priest? Catholic Answers – Is Confession in Scripture? Here is a prayer for humility.